Native American / First Nations individuals who are grounded culturally and in community are the focus of this Fellowship. They seldom have the financial resources and time for deeper contemplation in their own culture or the chance to engage and explore new skills and empower their leadership. The Tradition Bearers for Bio-cultural Diversity Fellowship provides support for individual Indigenous leaders to focus on, reflect, and contemplate the trajectory of their work in stewardship for biological diversity and cultural identity. Awards of $10,000 each to two applicants. During the year-long span of this fellowship recipients will expand their education (through traditional knowledge, education systems, or other capacity building activities), engage more extensively in their culture, and exploring the esoteric knowledge of the bio- and cultural diversity of the world. This exploration may be fulfilled through the expression of traditional language and/or stewardship practices in relation to Mother Earth. Fellowship awardees will be notified by March 8, 2019. Awardees will receive $10,000 towards advancing their education (cultural or academic), further their community-driven work or other efforts as a means to deepen their knowledge and build capacity towards improving and continuing their work within their communities. Empowering 2019 Arctic Indigenous Scholars and Making Connections is now accepting applications until Monday, January 10, 2019 by 5 PM. 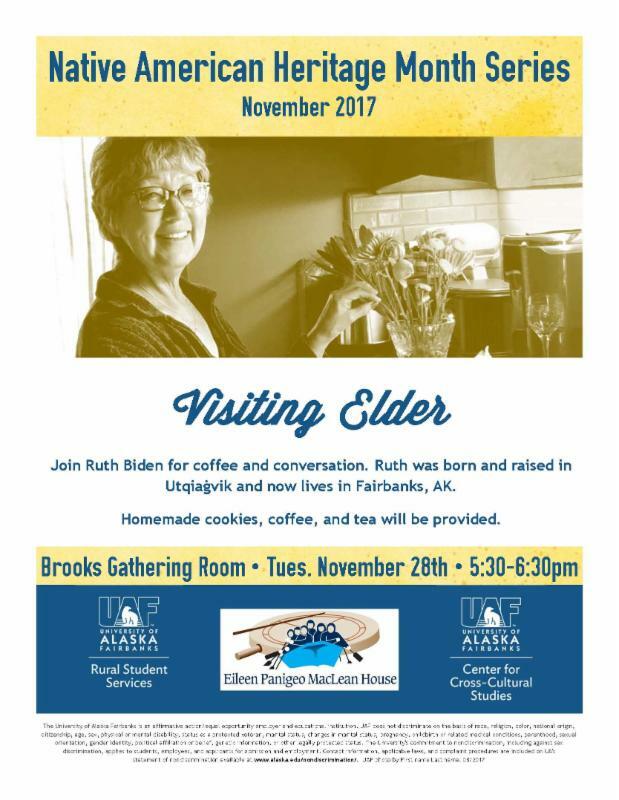 For further details, please see attached PDF or contact Lisa Sheffield Guy at lisa@arcus.org or by telephone 907-474-1600. To empower Indigenous scholars and provide a key opportunity for officials at U.S. government agencies, non-governmental organizations, and other groups working on Arctic issues to learn and integrate information/perspectives from multiple Arctic knowledge systems, ARCUS and ICC Alaska invite applications from and/or nominations of leading Arctic Indigenous scholars to travel to Washington D.C. Four scholars will be selected to participate in 2019 and travel expenses and per diem will be provided. While the selected Arctic Indigenous Scholars are in D.C., ARCUS and ICC-Alaska will facilitate meetings with officials at relevant agencies and organizations, where scholars will be able to share their interests, learn of available resources, build toward collaborative relationships, and provide on-the-ground perspectives to key decision-makers. 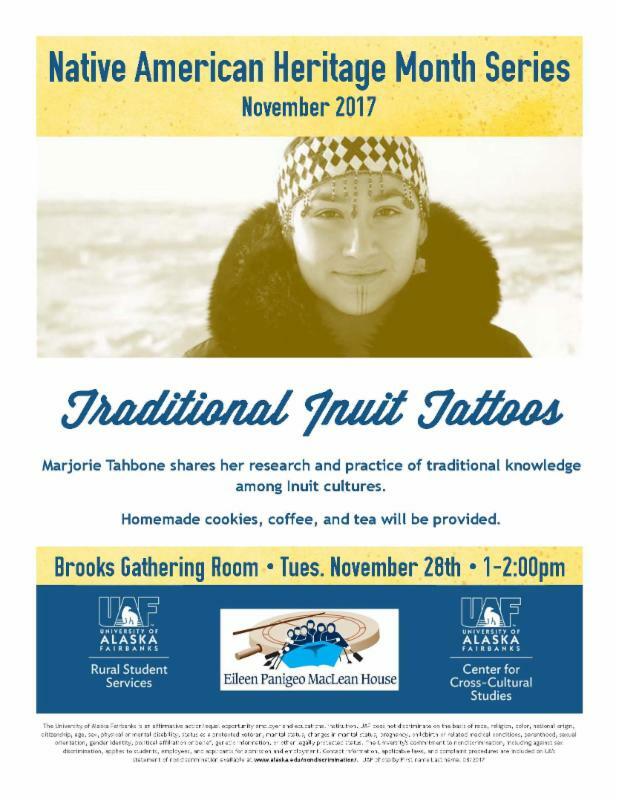 Indigenous Scholars will also provide an open seminar/webinar to Arctic policy-makers and others interested in the Arctic. 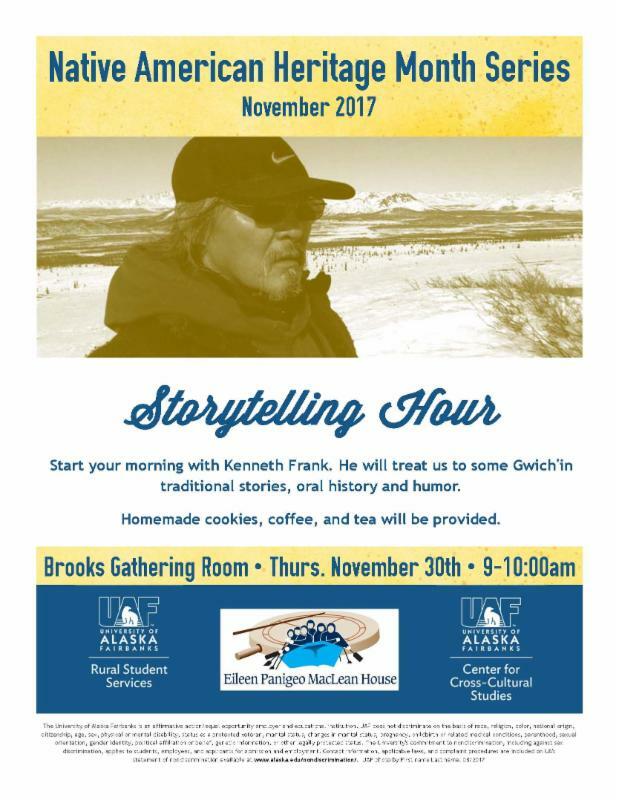 The Smithsonian Center for Arctic Studies will also host the scholars for a full day, with opportunities for scholars to present their issues, meet staff, and tour collections. Applications due Monday, 10 January 2019 by 5:00pm AKST. Join X̱’unei Lance Twitchell, Associate Professor of Alaska Native Languages, UAS, and Charlene Stern, Assistant Professor, Department Co-Chair, Native Student Union Faculty Advisor, Department of Alaska Native Studies and Rural Development, UAF for a workshop that proposes new models for education. Designed for educators and administrators from K-12 and higher education and educators in informal educational settings. Space is limited; registration recommended. Included with admission. Go to the below link to purchase tickets. The Tradition Bearers for Bio-cultural Diversity Fellowship is accepting applications until January 31, 2018. Candidates for this fellowship are Native American / First Nations working in their communities in the United States or Canada. This fellowship strives to build an awardee’s social network, individual capacity, strengthen their contributions to their field of endeavor, and provide direct support for a deeper inquiry into their culture and work. This is an opportunity for leaders in Indigenous communities to advance their aspirations and capacity, and an opportunity to re-invest these learnings back into their communities. The deadline to apply is January 31, 2018. Applications may be submitted between now and the deadline. All applications will be reviewed for selection between February 1 – March 2, 2018. Fellowship awards will be publically announced by the Seventh Generation Fund on March 9, 2018. Applicants must submit the application and include a 2-4 page personal statement outlining their experience in community-based work, how this work has advanced or continues to advance their communities, and how receiving this Fellowship would be beneficial in their work. Applications must accompany 2-3 letters of recommendation and photograph of the applicant. Materials may be submitted electronically at fellowship@7genfund.org or mailed to our office at P.O. Box 4569 Arcata, CA 95518. For further information, please contact Carlrey Arroyo, Advancement Assistant, at our office at 707-825-7640 or at fellowship@7genfund.org. Application materials are available on our website at: http://7genfund.org/tradition-bearers-bio-cultural-diversity-fellowship. Here are this week’s events! We hope to see you there! 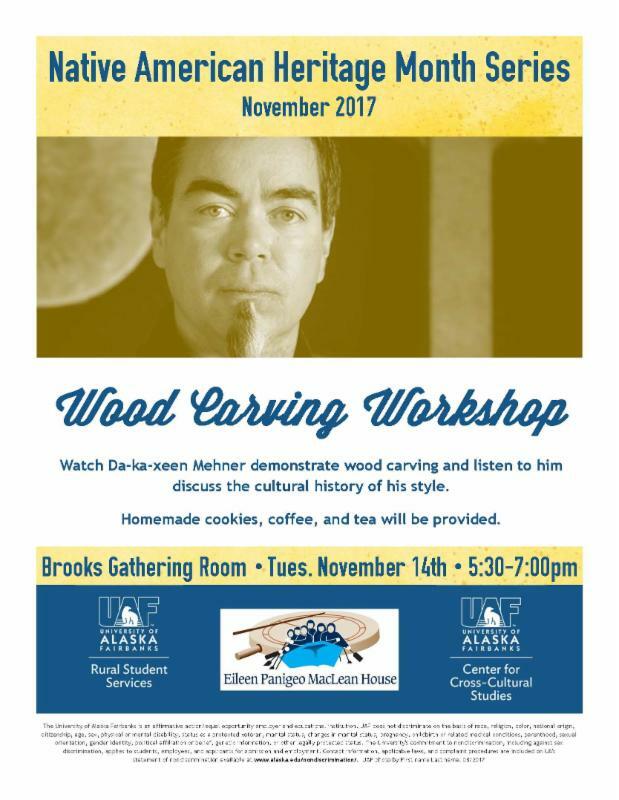 Watch Da-ka-xeen Mehner demonstrate wood carving and listen to him discuss the cultural history of his style. 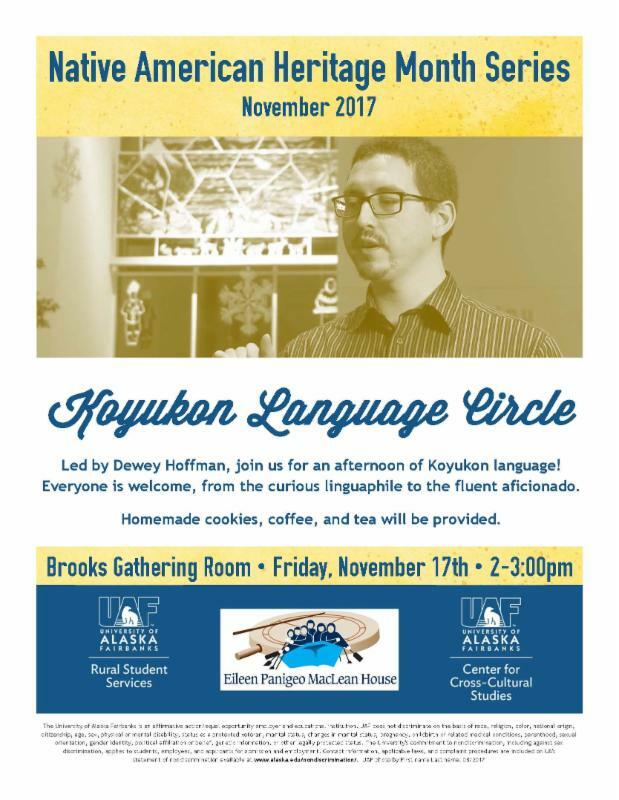 Led by Dewey Hoffman, join us for an afternoon of Koyukon language! 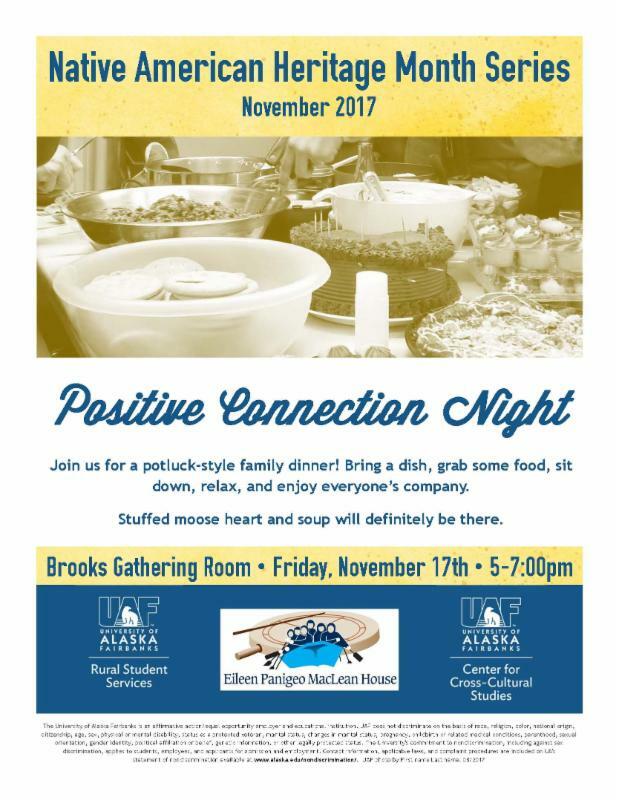 Join us for a potluck-style family dinner! Bring a dish, grab some food, sit down, relax, and enjoy everyone’s company. Stuffed moose heart and soup will definitely be there. 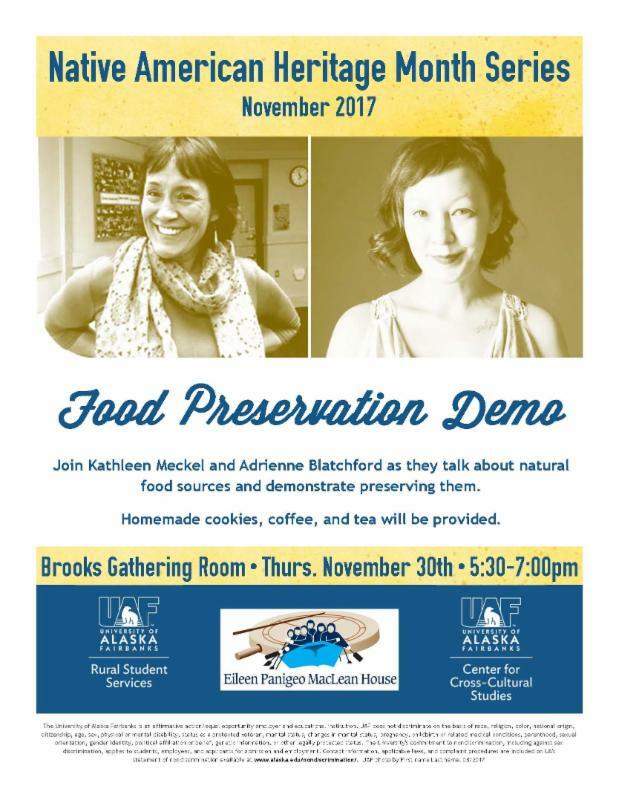 All events are free and will be in the Brooks Gathering Room. If you have any questions, please contact Brianna Pauling at bpaulin1@alaska.edu.